Oh my poor hair! I am combatting some really bad damage and breakage. Trust me, I baby my hair. I wash ever/other day, use good products, air dry as much as I can, and do weekly or bi-weekly deep conditioning and protein treatments. However, a recent bad color/highlighting experience has left my hair with chemical damage. Luckily, I am with a new colorist and am working towards getting my hair back into shape. My hair has been overprocessed and has breakage near the crown. Plus, the texture is "funny" when its wet. I suspect cuticle and possibly even some cortex damage in spots. I recently cut off about 7 inches and that certainly helps. However, much of my damage is near the roots and in the top layers of my hair. I am just going to have to grow out most of the damage. The good news is that there are products that can help! One of my favorites that I mention frequently and have reviewed here, is the Aphogee Two-Step Protein Treatment which I do before and after chemical services at the salon. I also use shampoos and conditioners formulated for damaged hair. On a weekly basis, I do conditioning and strengthening treatments. I tend to rotate these with my weekly Olaplex treatments. When you face damage from highlighting and chemical services, one of the most important things you can do for your hair is to add protein! Hair is approximately 91% keratin protein, and with daily styling and frequent exposure to chemicals, this can break up and weaken hair structure, ultimately causing fragile, unhealthy strands. This is certainly the current situation with my hair. The great news is that there are so many good protein treatments on the market! One of my recent favorites is the Madam C.J. Walker Beauty Culture’s Dream Come True Wonderful Pre-Wash Protein Treatment. As a powerful, protein-packed reconstructer, Madam C.J. 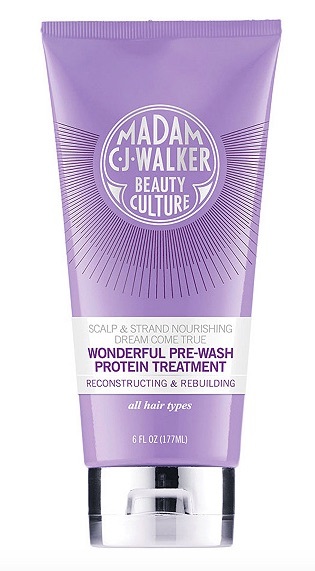 Walker Beauty Culture’s Dream Come True Wonderful Pre-Wash Protein Treatment ($32) is a rich cream to help strengthen your hair's keratin. It nourishes the scalp and strands before you shampoo, helping to fortify hair and prevent breakage. The ultra-nourishing Dream Come True Wonderful Pre-Wash Protein Treatment deeply penetrates to support the building blocks of hair. It restores dry, brittle strands damaged by chemical treatments, heat styling, and environmental aggressors. Simply apply the Madam C.J. 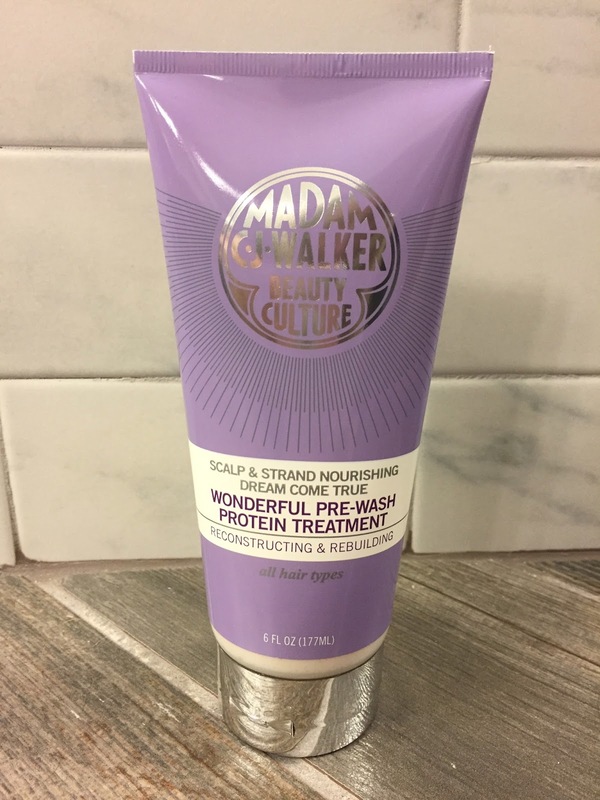 Walker Beauty Culture’s Dream Come True Wonderful Pre-Wash Protein Treatment from scalp to ends on damp hair before shampooing. I pay extra attention to areas of damage. The you leave it on for 15 minutes. I like to just do this at the start of my shower. I wet my hair immediately and wring it out at the start of my shower and apply the Madam C.J. Walker Beauty Culture’s Dream Come True Wonderful Pre-Wash Protein Treatment. Then I proceed to wash and shave, etc. Then I rinse out the hair treatment and proceed with hair washing. I find that using the Madam C.J. Walker Beauty Culture’s Dream Come True Wonderful Pre-Wash Protein Treatment on a every/other week basis adds luster, shine, and softness to my hair, while helping to prevent split ends and repair damage. Panthenol (Provitamin B5): Blocks moisture and keeps hair shiny. Coconut Oil: Adds luster, shine, and softness to the hair; helps prevent hair breakage and split ends.